Felix Edmundovich Dzerzhinsky (Polish: Feliks Edmundowicz Dzierżyński, Russian: Феликс Эдмундович Дзержинский, Belarusian: Фелікс Эдмундавіч Дзяржынскі; 11 September [O.S. 30 August] 1877–July 20, 1926) was a Russian Communist revolutionary, infamous as the founder of the Bolshevik secret police, the Cheka, later known by many names including NKVD, OGPU and finally KGB during the history of the Soviet Union. The agency became notorious for large-scale human rights abuses, including torture and mass summary executions, carried out during the Red Terror and Russian Civil War. Dzerzhinsky's statue, which towered over Lubyanka Square in Moscow, was toppled as part of the celebration of the collapse of communism. 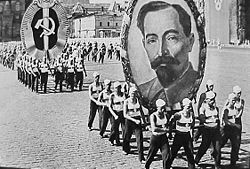 Dzerzhinsky became a symbol of repression in the Soviet bloc as well, and as such was a reviled figure. Dzerzhinsky was born into a Polish szlachta family of the Samson coat of arms in the Dziarzhynava estate near Ivianets and Rakau in Western Belarus, then part of the Russian Empire. He was expelled from school in Vilnius for "revolutionary activity." He joined a Marxist group—the Lithuanian Social Democratic Party in 1895, and was one of the founders of Social Democracy of the Kingdom of Poland and Lithuania in 1900. He spent the major part of his early life in various prisons. He was arrested for his revolutionary activities in 1897 and 1900, sent to Siberia, but escaped both times. He then went to Berlin, before returning to participate in the failed 1905 revolution, after which he was again jailed, this time by the Okhrana. After his release in 1912, he was quickly re-arrested for revolutionary activity and jailed in Moscow. In March, 1917, he was released (although Pravda usually asserts that he escaped, and indeed the facts are uncertain), along with many others, from the jail in which he had been imprisoned since 1912. His first act was to join the Bolshevik Party. On Lenin's orders in preparation for the overthrow of the Provisional Government, the Executive Committee of the Petrograd Soviet established a Revolutionary-Military Committee on October 12th. Dzerzhinsky was a member of that committee. The decision to move against the government was opposed by prominent Bolsheviks, including Lev Kamenev and Grigory Zinoviev. The debate was purportedly quite heated; Dzerzhinsky supported Lenin's call for insurrection. His incorruptible character, combined with his complete devotion to the cause, gained him swift recognition and the nickname "Iron Felix." Vladimir Lenin, leader of the October Revolution regarded Dzerzhinsky as a revolutionary hero, and after the revolution appointed him to organize a force to combat internal political threats. 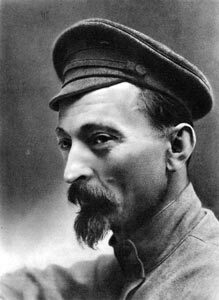 Dzerzhinsky had already served as head of a section of the Military Revolutionary Committee of the Petrograd Soviet assigned to combat counter-revolution, and was tapped by Lenin to head up the new security service. On December 20, 1917, the Council of People's Commissars officially established the All-Russia Extraordinary Commission to Combat Counter-revolution and Sabotage – usually referred to as the Cheka (based on the Russian acronym ВЧК). The Cheka received a large amount of resources, and became known for ruthlessly pursuing any perceived counterrevolutionary elements. As the Russian Civil War expanded, Dzerzhinsky also began organizing internal security troops to enforce the Cheka's authority. Lenin gave the organization tremendous powers to combat the opposition. The Cheka was created immediately after the October Revolution December 20 [O.S. December 7] 1917, during the first days of the Bolshevik government. Its immediate precursor was the "commission for the struggle with counter-revolution," established on December 7 [O.S. November 21] 1917, by the Milrevkom (the Military Revolutionary Committee of the Petrograd Soviet) on the proposal of Dzerzhinsky. It was subordinated to the Sovnarkom and its functions were, "to liquidate counter-revolution and sabotage, to hand over counter-revolutionaries and saboteurs to the revolutionary tribunals, and to apply such measures of repression as 'confiscation, deprivation of ration cards, publication of lists of enemies of the people, etc.'". The original members of the Vecheka were Peters, Ksenofontov, Averin, Ordzhonikidze, Peterson, Evseev, and Trifonov, but the next day Averin, Ordzhonikidze, and Trifonov were replaced by Fomin, Shchukin, Ilyin, and Chernov. Originally, the members of the Cheka were exclusively Bolshevik; however, in January 1918, left SRs also joined the organization The Left SRs were expelled or arrested later in 1918 following their attempted rebellion against Bolshevik rule. The original stated intent of the Cheka was to conduct investigations and hand over suspects to revolutionary tribunals, but almost immediately it became entrusted with or abrogated the power to inflict punishment, including the death penalty. Tens of thousands of political opponents were shot without trial in the basements of prisons and public places throughout Russia—and not only opponents. People who happened to be intellectuals, capitalists and priests were shot simply for who they were. 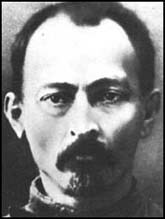 Dzerzhinsky himself boasted that: “[The Red Terror involves] the terrorization, arrests and extermination of enemies of the revolution on the basis of their class affiliation or of their pre-revolutionary roles.” Dzerzhinsky argued that "the Red Terror was nothing else but the expression of inflexible will of the poorest peasantry and the proletariat to crush all attempts at uprisings against us." At the end of the Civil War in 1922, the Cheka was changed into the GPU (State Political Directorate), a section of the NKVD, but this did not diminish Dzerzhinsky's power: from 1921-1924, he was Minister of the Interior, head of the Cheka/GPU/OGPU, Minister for Communications, and head of the Vesenkha (Supreme Council of National Economy). Dzerzhinsky's own position on the role of the Cheka changed over time. "In January 1921 Dzerzhinskii still stressed that much greater leniency should be shown to workers and peasants than to the bourgeoisie; by February 1924 he was radically opposed to 'liberal nonsense,' according to which, in dealing with accused persons, less severity was shown in the case of proletarians." 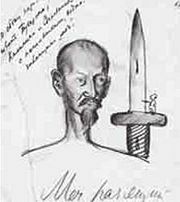 Despite the number of deaths than can be attributed to Dzerzhinsky, there is only one known instance in which Dzerzhinsky personally shot dead another human being. The source for this information is White emigre and civil war participant Roman Gul, who in turn reports a story told by left SR Alexandrovich, who held the post of deputy-chairman of the Cheka (thus Dzerzhinsky's right-hand man) up until the failed Left SR uprising against the Bolsheviks. According to Alexandrovich's testimony, once in 1918 a completely drunken Chekist sailor entered Dzerzhinsky's office. Dzerzhinsky tried to reprove him, but the sailor suddenly started to swear at him, mentioning all of his relatives. Dzerzhinsky then reportedly "shook with malice," pulled out his gun and shot the sailor dead. However, that immediately caused him to have a convulsive fit. Dzerzhinsky died of a heart attack on July 20, 1926 in Moscow, immediately after a two-hour long speech to the Bolshevik Central Committee in which, visibly quite ill, he violently denounced the United Opposition led by Leon Trotsky, Gregory Zinoviev, and Lev Kamenev. His name and image were widely used throughout the KGB and the Soviet Union—and her satellite states: there were six towns named after him. The town Kojdanava, which is not very far from the estate, was renamed to Dzyarzhynsk. There is also a city of Dzerzhinsk and three cities called Dzerzhinskiy in Russia and two cities in Ukraine called Dzerzhinsk. The Dzerzhinskiy Tractor Works in Stalingrad were named in his honor and became a scene of bitter fighting during the Second World War. There is a museum dedicated to him in his birth place in Belarus. Polish postage stamp commemorating the ninety-fifth anniversary of Feliks Dzerzhinsky's birth. The nickname "Iron Felix" refers not only to his own iron discipline and the iron fist of Dzerzhinsky and the Cheka, but to his 15-ton bronze monument which once dominated the Lubyanka Square in Moscow, near the KGB headquarters. It was erected in 1958 by sculptor Yevgeny Vuchetich and was a Moscow landmark in Soviet times. Symbolically, the Memorial to the Victims of the Gulag (a simple stone from Solovki) was erected beside the Iron Felix and the latter was removed in August, 1991, after the failed coup of conservative members of government. The memorial to Dzerzhinsky was toppled by a cheering crowd with the help of a crane. The event symbolized the end of repression. A mock-up of the removal of Dzerzhinsky's statue can be found in the entrance hall of the International Spy Museum in Washington, D.C. 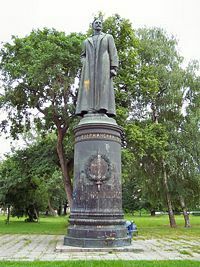 In 2002, Moscow mayor Yuriy Luzhkov proposed returning the statue to its plinth, but the plan was dropped after opposition from liberals and the Kremlin. The statue remained in the graveyard of fallen Soviet memorials at the Central House of Artists, although a smaller bust of Dzerzhinsky in the courtyard of the Moscow police headquarters at Petrovka 38 was restored in November, 2005 (this bust had been removed by the police officers on August 22, 1991). His monument in "Dzerzhinsky Square" (pl. Plac Dzierżyńskiego), in the center of Warsaw, was hated by the population of the Polish capital as a symbol of Soviet oppression and was toppled in 1989, as soon as the PZPR, or Polish Communist Party started losing power. The name of the square was soon changed to its pre-Second World War name, "Bank Square" (pl. Plac Bankowy). While statues of Dzerzhinsky became symbols of an era of repression through most of the former Soviet bloc, the opposite has been true in Belarus. After a brief period of democratic reform under Stanislav Shushkevich, Belarus became the only pro-Russian country of the former republics of the Soviet Union. In 2006, a new statue of "Iron Felix" was unveiled in the Belarusian capital Minsk on 26 March. The Belarusian KGB chief was present at the ceremony and said that the Belarusian KGB should follow the example of Dzerzhinsky in its activities. Numerous other items bear his name. In 1924, Dzerzhinsky organized a mechanical calculator manufacturing operation. The most successful pinwheel calculator model was named the Felix. This sturdy model was in service until the 1970s, and was known in folklore as "Iron Felix." There was a popular Soviet camera, FED. Initially it was produced by a working commune for homeless children named after F. E. Dzerzhinsky under the management of the famous Soviet pedagogue, Anton Makarenko. Later the production was expanded to a factory (also named after F.E. Dzierzhynski) in Kharkiv, Ukraine. The Felix Dzerzhinsky Watch Regiment was an elite motorized infantry regiment of the Ministry of State Security in East Germany. The birth date of Dzerzhinsky's infamous Cheka, December 20, has been declared a day of national celebration as "Security Organs Day" in Russia since 2005. ↑ The Road to Revolution BBC News, November 7, 1997. Retrieved September 6, 2008. Nenarokov, Albert P. Russia in the Twentieth Century. New York: William Morrow and Co., 1968. Shapiro, Leonard. The Communist Party of the Soviet Union. New York: Vantage Books, 1971. This page was last modified on 4 April 2017, at 20:59.